Ducks were in the process of being tallied at Melanie Lane Wetlands when, suddenly, the Green-winged Teal and Common Mergansers took flight. The above photo captures the young instigator who made several passes over the water before flying south towards Black Meadows. Melanie Lane Wetlands is thawed because the moving water of the Whippany River borders it on the east side. The gulls of last week are gone except for a handful of Ring-billed Gulls. Ducks present are: 4 Gadwall, 2 Northern Pintail, 20 Green-winged Teal, 6 Hooded and 20 Common Mergansers, as well as Canada Geese, Mallards and 2 American Black Ducks. A Killdeer, Wilson’s Snipe and Rusty Blackbirds are on the north side of Melanie Lane in the wet areas of the corporate lawns. Be aware that the professional soccer team, who is the tenant of the property on Melanie Lane, is building another field which is annihilating the mound of dirt affectionately known as Mt. Melanie. This effectively cuts off access to the wetlands from the north. Despite the pressures of development, this little gem of habitat continues to attract birds. 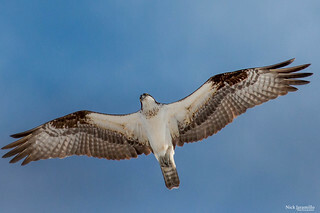 An Osprey was photographed today at the Great Swamp NWR by Nick Jaramillo (see photo below). A Redhead and other waterfowl were found at Hepner Pond in Denville (Tom Gorman via eBird). Mergansers are currently utilizing any open section of water, especially since most lakes in Morris County remain frozen. Indian Lake in Denville had a Red-breasted Merganser drake along with Common Mergansers and Ring-necked Ducks. This is another section of water that tends to remain open in even the coldest winters. This morning, 5 Red-breasted Mergansers (3 drakes, 2 hens) were on the open section of water at the north end of Boonton Reservoir along with a Common Goldeneye, a Greater Scaup hen, 2 Ring-necked Ducks and 31 Common Mergansers. A Greater White-fronted Goose was seen on River Road near the Norz fields in Hillsborough Twp. (Jeff Ellererbusch, Vicki Schwartz). Horned Larks continue to be in the area. Also present were 13 Killdeer, 6 Wilson’s Snipe and an assortment of waterfowl including Wood Duck, American Wigeon, Northern Pintail and Green-winged Teal. Glenhurst Meadows tallied 9 Wood Duck, 53 Northern Pintail, 12 Green-winged Teal, 10 Ring-necked Ducks along with the typical species of the area (Jeff Ellerbusch). The Black and Turkey Vultures of the Green Pond Road roost continue to be intriguing. The Rough-legged Hawk is a misprint. It is an Osprey.